LONDON – The Zig Zag cafe is nestled between an art shop and a beauty salon on the main street in Epsom, an affluent market town 30 minutes by train from central London. 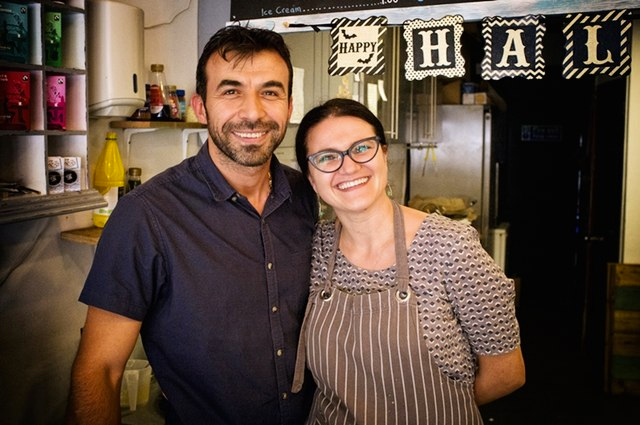 This small and unassuming cafe has become a social hub for the local community of hosts and their refugee or asylum-seeking guests. As the hosts and guests arrive, Mike, who runs the cafe, starts pushing tables together and pulling up extra chairs. He’s well used to the routine. Each newcomer is treated to a beaming smile and a warm “hello.” Some guests stay just for a coffee; others linger over one of Mike’s infamous falafel pancakes. Mike is Syrian. He arrived several years ago on a work visa, but recently left his job to open the Zig Zag cafe. It was perfect timing. Nina and Timothy, a local retired couple whose children had recently left home, had decided to offer their spare rooms to asylum seekers. No organization existed to help them so they started one and called it Refugees at Home. 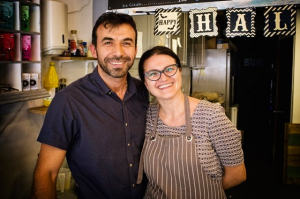 While showing one of their early guests – Ahmad, a reserved and hesitant young Syrian man – around Epsom, Nina, who had heard about the new cafe, decided they should take a look. “Mike was so welcoming,” Nina said, “and the atmosphere was just lovely.” Ahmad began to relax, too, and, having insisted he was only staying with Nina and Timothy for a couple of nights, went on to live with them for four months. “I had no idea that anybody cared,” he told her. The cafe quickly became the project’s social hub in Epsom. Since February, over 200 refugees and asylum seekers have been hosted by the project, which recruits hosts locally and across the country and matches them with newcomers in desperate need of a bed. The aim is to get them back on their feet. The organization runs on zero budget and relies entirely on volunteers. Legal support is offered pro bono by London law firm Travers Smith. Some of the guests are referred by charities such as the Refugee Council and the British Red Cross, while others refer themselves. The majority are destitute and have fallen through the cracks in the asylum system. Once asylum seekers are given leave to remain in the U.K., they have just 28 days to find somewhere to live before they are evicted from their accommodation. Many wait far longer than that just to receive their National Insurance (social security) number – without which getting a house, job or bank account is impossible – and find themselves homeless when that four weeks is up. Niloofar, an exuberant and headstrong 23-year-old woman from Iran, was given leave to remain in the U.K. on September 21. As of October 27, she was still waiting for her National Insurance card. She arrived in the U.K. earlier this year with her mother, Soraya, and younger brother, Isaac, after a grueling journey that ended with 15 hours spent in the back of a refrigerated supermarket lorry. After claiming asylum, Niloofar was sent to Newcastle upon Tyne, 560 kilometers (350 miles) away from her mother and brother. 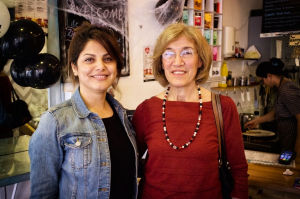 Knowing no one, destitute and with no means of getting an apartment or a job, Niloofar, who dreams of becoming a dentist, returned to London and is now living with Nina. “Refugees at Home has been my only positive experience in this country,” she said. “They give you so much more than a house,” he said of his hosts. Twice, war destroyed any chance David had for a family life. “Refugees at Home has given me the ultimate family experience,” he said. “A little sweet treat on the house,” said Mike, setting down a plate of pancakes drizzled with cinnamon and chocolate. It’s easy to see why the hosts and guests love to come to Zig Zag – and it’s not just the culinary temptations. Mike treats his customers with the same warmth and respect as Nina and Constance show their guests.